As the World observed the International Day for the Elimination of Racial Discrimination, United Nations Secretary General Ban Ki Moon has noted his alarm at the sudden surge in racism and hate driven violence in today’s society. Ban in a message delivered to a General Assembly meeting on Friday pointed out that while some strides have been made with regards to equality, there is still a lot to be done. “We have undoubtedly come a long way in ensuring equal rights and non-discrimination. Member States have adopted or amended legislation to guard against racial discrimination,” said Ban. The Secretary General was adamant that while a lot has been done the prevalence of certain social ills is indicative of how much further humanity has to go to ensure equal rights for all. He noted that extreme right-wing political parties are fomenting divisiveness and dangerous myths. Even once-centrist parties have hardened their views; once-moderate countries are seeing xenophobia rise sharply; and once-sober voices have exploited fears in a dangerous echo of the darkest chapters of the last century. “All of this increases the risk of societal fracture, instability and conflict. In these tumultuous times, we must stand up for rights and dignity for all, and for diversity and pluralism. We must speak out against anti-Semitism, anti-Muslim bigotry and other forms of hate. 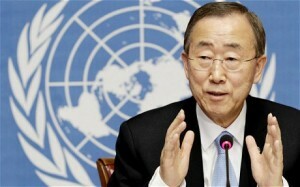 An assault on one minority community is an attack on all,” said the UN Chief. He expressed some concern that the political will that existed fifteen years ago is under threat noting that the collective determination that enabled such a far-reaching agreement is being undermined by political expediency.